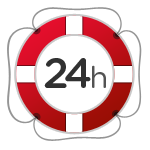 24-hour Customer Support for CodeTwo clients since today! Have a question to CodeTwo and it’s 3 am? No problem. CodeTwo Sales and Tech Support teams are awake all the time! Since we want to provide the very best customer support services to our clients, we are now available 24 hours a day, 5 days a week. CodeTwo’s Customer Support, located entirely in CodeTwo HQ (and nowhere else as we don’t outsource support), is ready to help you via telephone, email and online chat at any time! Don’t hesitate to contact us for any sales or technical questions. Our support guys are always happy to assist. Yes, It is possible to place a signature under reply/forward using CodeTwo Email Signatures for Office 365. You can try out this function in the free trial. The free trial includes all the program’s features for 14 days. You do not have to buy a subscription during the trial period or after it ends. If you choose to buy program after you have tested it, all your settings from the trial period will be kept. Hi Lisa. Thank you for contacting us. Our Customer Service has been notified about your case and they will be contacting you shortly.